Just how do you use word of mouth? Here, we’ll go over all aspects of how you can increase your word of mouth marketing. So you’ve kick-started your word of mouth marketing and need to find more ways to increase your marketing efforts. 50% of word of mouth recommendations are the leading factor behind a purchasing decision and 92% of consumers trust recommendations from the people they know. However, telling people about your product and expecting word of mouth to go viral is not a strategy and not something you can really measure. 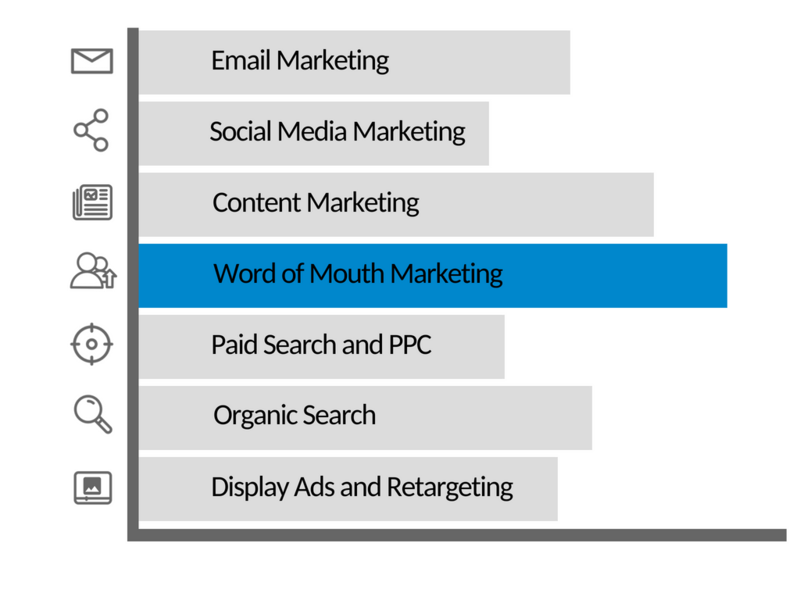 We’ve come up with a few ideas to help you increase your word of mouth marketing to help grow your business. If done right, you can see an increase on word of mouth (there are plenty of wom statistics that prove when it works, it really works). Think of it as social currency – share what makes you look fun/good/interesting. This will entice sharing. The consumer will feel confident in the information they are sharing. They will be contributing to something that is worth talking about. Kudos for being the smart cookie. Can you tie yourself into other things that your consumers do or use? LiveChat mentioned, “you can design products that are often triggered by the environment and create new triggers by linking your products and ideas to prevalent cues in that environment”. If people remember you, they will continue to talk about you. Sounds like a great way to start a successful referral program. If you establish yourself with a few people, they will share the experience with friends. You may not remember the last time you shared a mediocre restaurant or service with someone. But, you can remember an amazing experience at a Japanese restaurant. You also know a coworker who loves sushi. You’ll tell them all about it since it is something that you know that person will value. You know that by sharing valuable information makes you valuable. Great customer service and having a great product are just a few ways to up your value. Creating emotion goes hand in hand with creating value. People are more likely to share something that promotes high arousal. People are more likely to share experiences in which they had some sort of emotion towards. No one shares an ‘OK’ experience. People share the things that make them happy or upset. Think about Yelp – the reviews are either one extreme or the other. Hardly ever does someone take the time or effort to talk about their experience if it was average. People only praise or recommend something they like. So keep your current customers extremely satisfied, this will encourage them to recommend your brand. Find ways to show that you care about them, pay attention, and worry about your client’s success. Having highly satisfied customers is the starting point for word of mouth marketing. Within your word of mouth marketing strategies, your customer’s experience is very important. People like to be surprised, to get better-than-expected care, a toast, or an unexpected thank-you. Delivering something more and maybe even a little surprising is a great way to encourage customers to speak positively about your brand. Innovate in your segment, be original in your ideas, through a specific product, or unusual marketing ideas, or even the company culture. Being unique and out of the common can draw attention to you, and it is important to use this strategy to differentiate yourself. By nature, people are storytellers and love listening and passing on interesting stories. The tip I share is if you want your brand to be in the consumer’s mouth it’s worth learning to be a good storyteller. By being a storyteller, it becomes easier for you to delight your customer, and in return he or she spreads your message. Pass on trust to your client. You can do this by showing them that you have knowledge on the subject. This does require a certain level of effort, but surely the long-term benefits will outweigh the dedicated effort. When your brand becomes a thought leader in your segment, word of mouth will soon appear. People value companies that are honest and transparent, this gives more confidence to the consumer. Treat your customers well, respect them and they will reciprocate kindly. Create strategies to encourage word of mouth marketing to happen. You can invite your customers to share your content, post photos of your products on social networks, create content related to your brand, check-in, write reviews, etc. All of which fuels word of mouth. Regardless of how you will do this, whether it will be through a simple “thank you,” with a special benefit, an email, or a public thanks on your social networks, the important thing is to thank the customers who are talking about your brand and recognize them by actions. People will see this and appreciate it and your business even more. You might even spark them to keep sharing and you might get others to join in to get recognition too. People love feeling appreciated. Stay in touch with your customers by informing them of specials. You can do this by sending them coupons once in a while, or simple flyers. This will help them increase their visits to your business. You can also inform them of changes and updates within your business. People are nosy and like to be in the know. Especially when it comes to learning about new product updates and your vision. Engaging with customers online is a great andeasy solution. You can provide quick updates and blast it out for all to see at their own leisure. Viral marketing campaigns are those that use entertainment to encourage people to talk about a particular brand or product. Perhaps one of the oldest and even most successful examples of viral marketing has been the launch campaign for the Blair Witch movie. The producer released some notes, casting doubt on the truthfulness of the events discussed in the film, arousing the interest of thousands of viewers who spent weeks discussing the subject in all digital media. The process of evangelization consists in finding out who are the natural and spontaneous ambassadors and promoters of your brand. You can be sure: they exist! They are those people who admire and use their products and services and who easily engage in spreading the information throughout their life cycle. It is important to find who in your market are the influential individuals. The ones who have a high power of persuasion and a constant and powerful dialogue with the population at large can be great for business. From there, you should strive to present your product to these people. Building a unique and very positive experience, in the expectation that the whole process and brand differentials be communicated by these people. Why? Because then you have the potential for reaching a huge audience. An effective way to increase the visibility and reach of a brand is to create communities of common interest for users to talk about products, exchanging views on usage, key differentiators, and possible improvements. You may find there are groups on social sites that already exist! You can join them or start a community of your own. Regardless of the area of activity, the size of the company or the moment lived, word of mouth should be seen as a fundamental strategy to achieve better results. You must realize that the users who talk are a tool, and have of wide reach and the power of convincing. This is why precisely the reason, it deserves great attention and dedication. You can play up great comments and use them as testimonials and give shout-outs to amp up your positive vibes. All word of mouth marketing is based on the dissemination of positive, interesting, and relevant information about the brand. The experience of other users… a.k.a ‘reviews’ can encourage potential customers to make a purchase. However, it is up to the online reputation manager to be constantly aware of what’s being said online. Opinion and experience can be expressed and shared, and negative feedback is also included in that. Knowing how to turn the negative comments around, and turn them into benefits for the brand is very important. The first point, of course, is to be open to criticism and opinions. Remember that your users have had an important brand experience and they tend to repeat themselves to others. So if the experience was bad, adopting strategies to reverse the situation becomes urgent and necessary. More on our guide to brand reputation management. You as a seller need to find ways in which a customer feels like he is part of the company. For example, by asking for their opinion and taking their feedback seriously you can build a better brand (that customers want). And this can spark conversation in a good way. You can also generate word of mouth marketing by providing a forum for influencers to sit down and have a good chat about your brand. Influencers and influencer marketing can be very appealing and the use of influencers has skyrocketed. So if you can get a niche influencer to sit down and discuss your brand, you will likely reap the benefits. Use of valuable incentives helps a lot when it comes to encouraging word of mouth marketing since it gets the customers talking. Some will talk about it when asked and some will just do it on their own. Offering valuable incentives will help spread the word about your product. Incentives rewards can be in the form of clothes, mugs, cash, discounts, new products, gift cards, store cards, USB drives, and many more. Incentives are driving factors, which is exactly why many people start some sort of rewards program. To go on what we just mentioned, incentivizing customers… The simplest way to getting more word of mouth is to get customer referrals with a referral program. In fact, people are usually happy to help others so asking for referrals makes sense. Creating an opportunity for your customers to talk about your product or services has been the ultimate word of mouth marketing strategy. In fact, 81% of consumers are influenced by social media posts from their friends. Read our best practices for referral marketing on social media. Align with customers vision – You just have to understand the specific needs of your customers and work with them for your own benefit. Client feedback – It helps in the evaluation of the product and service and helps you deliver what people want. Pair a great product with these great experiences – Customers are usually willing to pay for a product or service from a business that stands out, so make yourself shine! A streamlined referral process can help people have a great experience spreading the word (and get an incentive for doing so). Stay proactive whether your business is small or big and you’ll be golden.